Different disciplines use the terms above in slightly different ways, but the core principle is widely used in various fields. Here are some examples of how these concepts can be applied to education. Wisdom: Knowing why different schools of history view the significance of the Battle of Edgehill in different ways. Knowledge: Knowing that both sides at the Battle of Edgehill were inexperienced and poorly trained. Information: Knowing the comparative figures for cavalry, infantry etc in the Parliamentarian and Royalist armies at the Battle of Edgehill. Data: Knowing the number of soldiers in a particular unit at the Battle of Edgehill. Educational philosophies emphasise different parts of the knowledge pyramid. Some philosophies emphasise “facts”. Those approaches focus on individual pieces of data, at the expense of understanding how those pieces fit together. Other philosophies emphasise “understanding”. 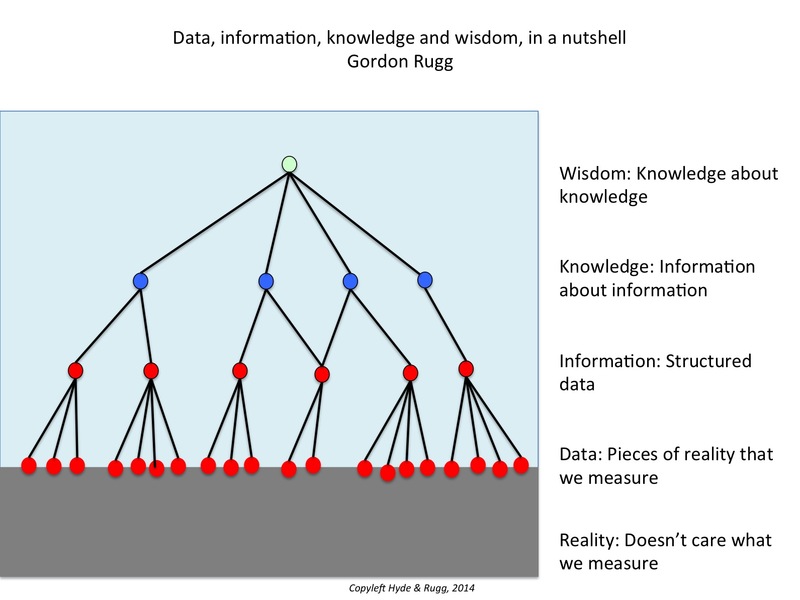 These approaches focus on how the pieces of data fit together as information and/or knowledge, but can encounter problems if the students don’t have enough individual pieces of data to see how the information and knowledge map on to reality. These issues overlap with the concept of craft skills, which I’ve blogged about earlier. They also raise important issues about the meaning of “reality” and “truth”. This is well known to professional academics, especially in disciplines such as history, where simplistic rhetoric about “just teaching the facts” tends to get short shrift. Conversely, empirical sciences tend to take a dim view of models of reality that don’t pay close attention to the low-level data. In later articles, I’ll unpack some of these concepts in more detail, and show what the practical and theoretical implications are for education. Note for curious readers: I’ve deliberately shown the data-level circles as unevenly distributed, to indicate the way that data are usually messy and often incomplete, because of their interactions with reality. The higher levels, being less directly in contact with reality, are often fitted into neat levels and categories by the human beings who try to make sense of the data. Note for historically knowledgeable readers: I’m aware that the statement above about both armies at Edgehill being inexperienced and poorly trained is a simplification of the reality. That awareness is exactly the sort of meta-knowledge that’s important in education, where your explanation to students will vary depending on the level of detail at which you’re describing something. The Hyde & Rugg image above is copyleft; you’re welcome to use it for any non-commercial purpose, including lectures, provided that you retain the Hyde & Rugg copyleft attribution. This entry was posted in education theory, metalanguage, visualisation and tagged levels of analysis by hydeandrugg. Bookmark the permalink.